This Health Foundation evidence scan provides a brief overview of some of the tools available to measure safety culture and climate in health care. Safety culture refers to the way patient safety is thought about and implemented within an organisation and the structures and processes in place to support this. Safety climate is a subset of broader culture and refers to staff attitudes about patient safety within the organisation. 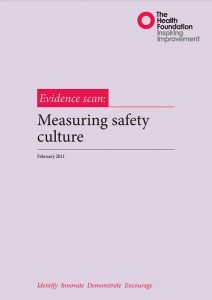 Measuring safety culture or climate is important because the culture of an organisation and the attitudes of teams have been found to influence patient safety outcomes and these measures can be used to monitor change over time. It may be easier to measure safety climate than safety culture.